So a few things happened to my taste buds once I had children. I was always one of those people that was a ‘savoury’ person as opposed to a ‘sweets’ person. I loved chips and in particular corn chips. I would love having a packet of Dorritos or CC’s when the mood took me. But when I was pregnant with my son, I stopped liking salty things. Also, when I did have salt in foods it would make my feet swell and made it uncomfortable. So to deal with this, I stopped eating salty foods altogether. Now, you might think this was a drastic move. But no, it did make the pregnancy fat foot thing better. It also did something else: I stopped wanting salty foods. Now I cannot actually remember the last time I had a packet of chips and I rarely add salt to my foods. Good thing too, particularly now that I am on my palm oil detox. In fact I saw a funny ‘ad’ made for Dorritos that I suggest you check out. Now what do I do when I feel like a salty snack? There are a lot of things that I make at home myself, one of which is Kale Chips. 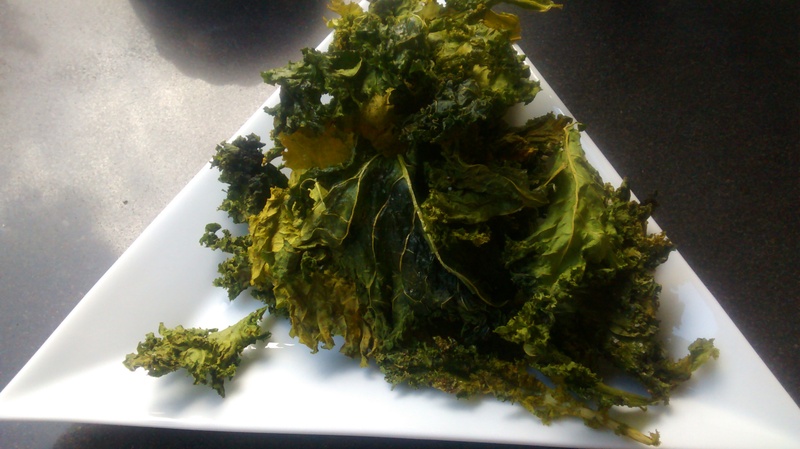 Kale Chips are super easy to make and a great way to get kids to eat green stuff! All I do it to cut out the hard stems and vain of the kale leaves, then spread it onto baking paper and pop it in the oven on low heat. I spray a little oil on it and add some rock salt. Once one side is dry, then I turn and do the other side. Once crispy, eat and enjoy. This latest batch even got a thumbs up from my children – who are very fussy mind you! ~ by em0navari on April 7, 2015. This entry was posted on April 7, 2015 at 11:58 am and is filed under Eating, Ethical Shopping.You can follow any responses to this entry through the RSS 2.0 feed.You can leave a response, or trackback from your own site.